The unlimited ability of any old national or international speculator to buy UK land is forcing rents and prices above the means of the poorest households and reducing the amount of land on which truly affordable council housing can be built. Poor unemployed, and not so poor employed, working aged families, are quite literally being ejected out of secure accommodation into temporary accommodation by the market. There are no plans to change that; the 1750s clearances and enclosures come to mind; they privateised common land. Here in Tottenham the council rent for two bedroomed accommodation is £90pw and PRS rent is £300pw. I am working with homeless families in temporary accommodation here in Tottenham and in Enfield. That has included visiting scared women and children in crowded homeless hostels. Scared of a life time being forced by councils and landlords from one temporary property to another. In the borough of Haringey there are 4400 homeless families and in Enfield 4000, according to Trust for London, many more than they can accommodate in available truly affordable council housing at council house rents. This is a redacted letter I have sent to Enfield Council on the 29th March which illustrates some of the debilitating traps in which families are caught throughout London. "This family of five in temprary accommodation receive social security payments for only three of them. Their mother has no passport and their third child is six months old so neither of them is entitled to any social security payments. Their son age 9 receives DLA indefinitely. Their father and another son aged 5 are fully entitled to all benefits. The inadequate benefit incomes they receive have been shredded by central government and they pay 26.5% of the council tax. Therefore forcing them into the Private Rented Sector is unreasonable; the rents are prohibitive for a family of five with the income for three. Their is none of the security of tenure in PRS needed by the disabled son because the landlords can evict without reason; so they are more than likely to be returned to temporary accommodation. Your Assessment and Allocations manager has missed the point about their need to remain in the same area. His assessment of the type of home they need is fine but the need of their disabled son is to remain in the same school for the sake of his education. He is severely sight impaired, has cerebral palsy on his right side, has developmental delay and sensory issues. His father has a file full of medical evidence he can show you. It has satisfied the DWP that his severe disablement justifies making his DLA permanent. It seems only reasonable that the council should exercise its discretion to allocate a secure council property in this case". 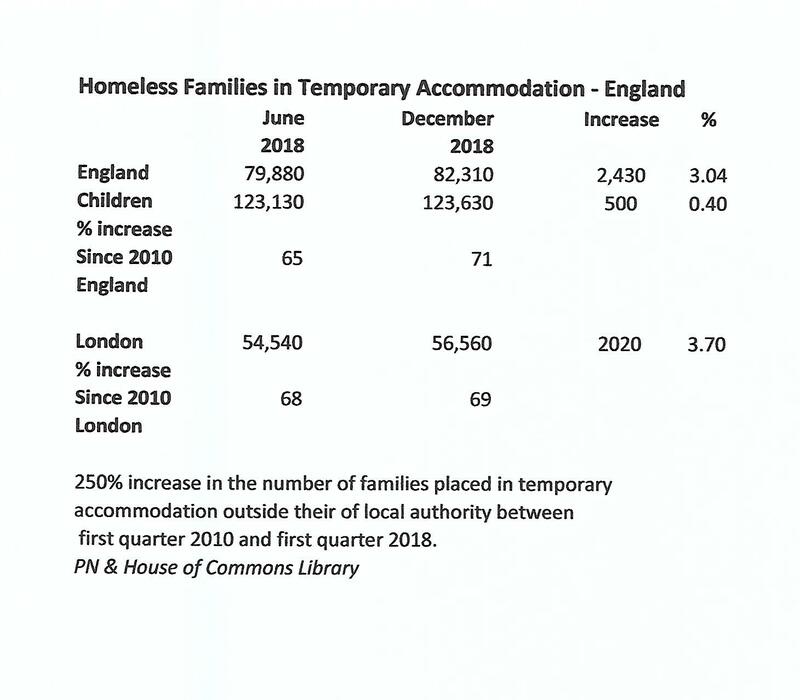 The number of families in temporary accommodation has grown rapidly since 2010. Some have been there for ten years or more being forcibly moved several times by landlords and councils even into filthy buildings. There is nothing to stop more and more of them being expelled into that misery. Here are the latest figures from the House of Commons Library.